In designer Scott Croyle's San Francisco home, architect Cary Bernstein selected sequenced walnut veneers for the kitchen and dining area. The counters are from Caesarstone, the Chrysalis bar stools are by One & Co for Council, and a Foscarini pendant hangs above Ligne Roset’s Eaton table and bench. Clean, white cabinets and a marbled countertop create a modern contrast to the rustic wood floors of this custom kitchen in a 1850s Pennsylvania farmhouse. The kitchen of an Illinois couple's home sports blue-gray cabinets and Azulej tiles by Patricia Urquiola for Mutina. A large Pella window looks out to the backyard and is situated above the sink, with a Sensate faucet from Kohler. The range is by BlueStar. In the dining area of this Wisconsin prairie home, a Campo d’oro table from De Padova is ringed by vintage Michael Thonet Bentwood chairs. 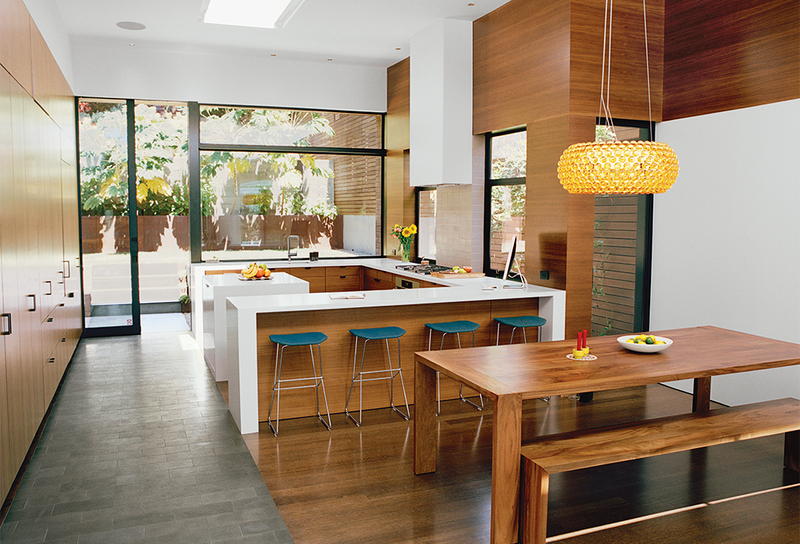 The kitchen features b3 cabinets by Bulthaup and custom stainless-steel countertops. The red Stool_One counter stools are by Konstantin Grcic for Magis. The restoration of a midcentury L.A. home transformed the old kitchen into a bedroom/study and brought the outdoors in to the new kitchen through a glass wall that looks out to the home's original courtyard. The cabinets are from Ikea, the countertops are quartzite, and the grill top is from Bertazzoni. A Connecticut kitchen shows off Japanese elm cabinets, topped with Calacatta marble and wraparound concrete for the island. In Tennessee, laminate kitchen cabinets in varying shades of blue are topped with Corian in Glacier White. Satin nickel door hardware by Mockett and stainless steel appliances by Thermador add a touch of sophistication to this modern cabin in the woods. David Alan Basche, Alysia Reiner, and their six-year-old daughter, Liv, chat in their Harlem kitchen, which is defined by a reclaimed spalted maple countertop crafted from a felled 100-year-old specimen sourced by The Hudson Company. The barstools are from Blu Dot.